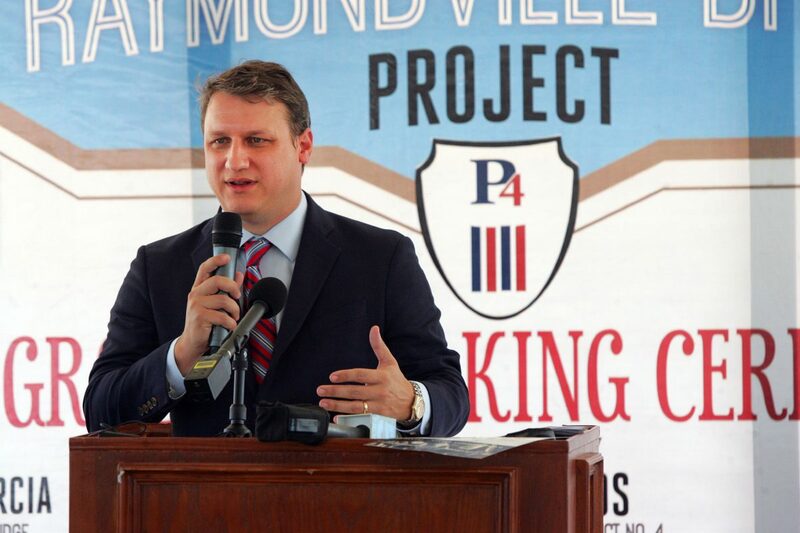 Texas Water Development Board Chairman Bech Bruun speaks during the Raymondville Drain project groundbreaking ceremony October 6, 2017 in Edinburg. 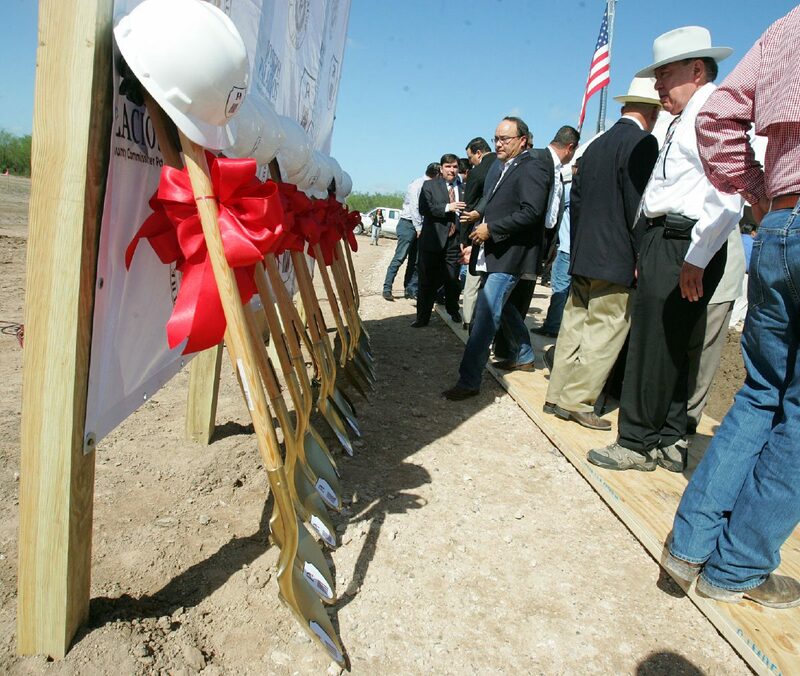 EDINBURG — Local, state and federal officials came together Friday to celebrate the groundbreaking for the Raymondville Drain Project, a 63-mile long, 350-foot wide flood control project that will stretch from Lake Edinburg to the Laguna Madre. The $400 million project is a culmination of more than 30 years of planning and work to obtain funding. It will provide an outlet for floodwaters from northern Hidalgo County and Willacy County into the bay. It started in 1986, said County Commissioner Joseph Palacios, when the Army Corps of Engineers visited and identified the need for infrastructure and specifically drainage. 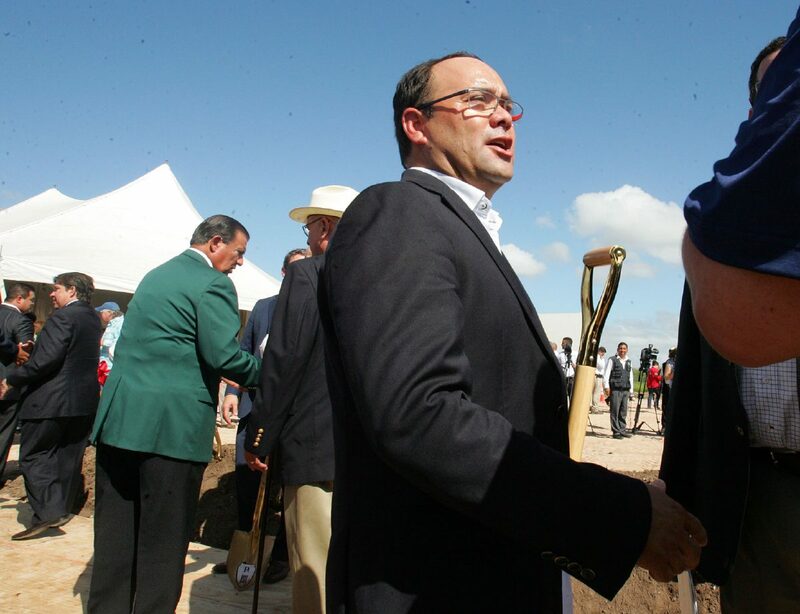 “With the leadership that we had on the congressional level, both past and present, we were able to get the federal government to acknowledge our project here in Hidalgo County and make it a reimbursable project by 75 percent,” Palacios said. Hidalgo County Precinct 4 Commissioner Joseph Palacios points to the field that will be part of the Raymondville Drain project during the groundbreaking north of Edinburg. Former Hidalgo County Precinct 4 Commissioner Joseph Palacios talks with community leaders during the Raymondville Drain project groundbreaking ceremony Oct. 6, 2017, north of Edinburg. 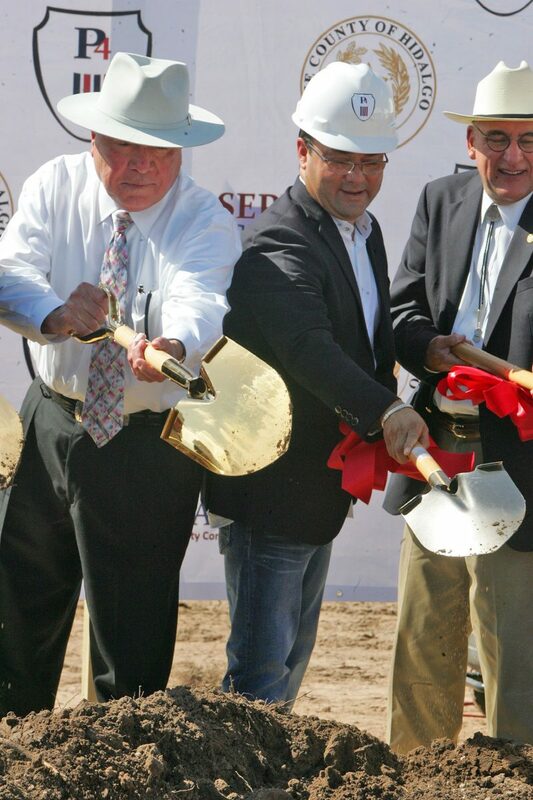 Hidalgo County Precinct 4 Commissioner Joseph Palacios, right, and state Sen. Juan "Chuy" Hinojosa break ground at the Raymondville Drain project site along with others October 6, 2017 in Edinburg. Community leaders prepare to break ground for the Raymondville Drain project October 6, 2017 in Edinburg. U.S. Rep. Vicente Gonzalez, D-McAllen, noted the flood reduction provided by the project would not only protect residents and infrastructure but would also spur economic and residential growth in low-lying areas. So far, the county has secured $17.1 million from the state for the project with the help of Valley state Sens. Juan “Chuy” Hinojosa and Eddie Lucio Jr. Part of that was a $4.5 million grant from the Texas Water Development Board awarded to the county earlier this year for the first phase of the project. The initial phase will directly benefit Faysville area north of Edinburg, a community often affected by flooding. Hinojosa noted the importance of the project given the recent flooding in Houston and Coastal Bend due to Hurricane Harvey. A hurricane like that, he said, is bound to hit the Rio Grande Valley sooner or later. “ We know it’s going to happen, it’s just a matter of timing,” he said. 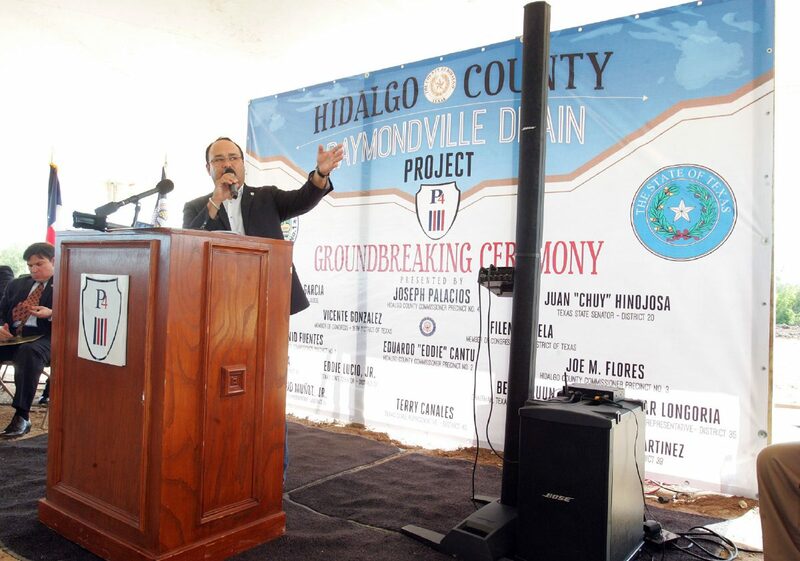 The Raymondville Drain will be constructed in phases and Hinojosa urged officials to pick up the pace in securing the funding for the rest of the project. “If we don’t, it’s going to cost lives and in the long-term it’s going to cost us a lot more money, a lot more money that is needed to finish the project,” Hinojosa said.